You will create a new ATC for your 1 partner. The ATC must include at least 1 used postage stamp. No sticker slapping. Take your time. ALSO! The envelope you send must include at least 3 postage stamps. On the back of the ATC include the swap name and your info. 2.5x3.5 inches. 5.0 to participate. No newbies. 1 month to send. 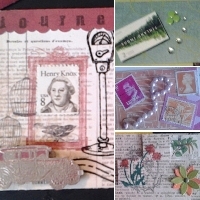 For inspiration, Google image search: postage stamp ATC.